We're normally not into visiting modern racing events that much but we thought we'd make an exception for the Spa 1000kms event. As the second round of the 2010 Le Mans Series it was also the big endurance teams' dress rehearsal for the Le Mans 24 Hours, and thus the next best thing to visiting the Sarthe itself. What finally clinched it was the fact that we've grown particularly fond of six-hour races at Spa, having visited the 2006, 2008 and 2009 editions of the blue-riband Spa Six Hours for historic racing cars. And what a great idea it was. The race itself was a corker, with spectacle from the first to almost the very last corner. 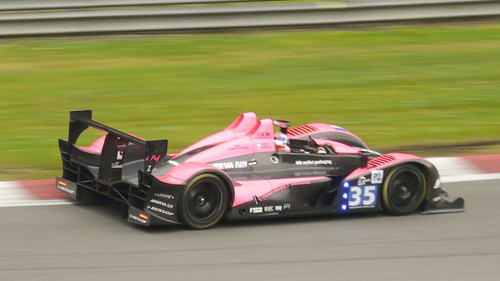 Eventual winner Pedro Lamy spun out on the first lap to recover with the help of team mates Sébastien Bourdais and Simon Pagenaud while the other two Peugeots finished second and fourth to claim a resounding first strike to the Lions as the prepare for Le Mans. The fourth Peugeot driven by Olivier Panis for the privateer ORECA team was out very quickly, however, having been knocked off the track by Jean-Christophe Boullion's petrol-powered Lola prototype at the foot of Eau Rouge. And this was after a first-lap Eau Rouge smash by Filippo Francioni in the second LMP2 Racing Box Lola and André Lotterer sliding his Audi R15 TDI Plus into the wall at Les Combes, all with some 998kms still to go! Bas Leinders in the GT1 Ford was the only exception to the rule that you don't need to win an endurance race on the very first lap, as the local hero was among the slower prototypes right from the start and hung on to win his class with team mates Markus Palttala and Eric De Doncker. sandwiched by the LAA Corvette and Matech Ford GT1 cars. Then, almost halfway into the race, everything went blank. A comprehensive power failure in the entire region of Spa-Francorchamps switched off the timing equipment and the TV screens, and more importantly the communications with the marshalling posts around the tracks and the air jacks in the pits. It seemed strange to red-flag a race for that, and it certainly wouldn't have happened in the olden days, but it showed today's total dependance on electricity. Near the end, there was more drama when a light drizzle wrong-footed Audi's second-placed Tom Kristensen, who ducked into the pits to collect a set of intermediates. The rain almost immediately stopped at the moment the Dane came out again and he was a sitting duck for Stéphane Sarrazin, the Frenchman completing a maniac comeback race for Peugeot no.2 after it had collided with Jonathan Kennard's KSM Lola at Blanchimont just ahead of the power outage. The team used the race delay to very good effect to repair the damage and give the car a chance of a podium finish. It worked. 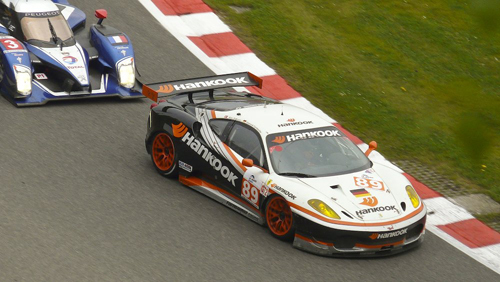 The Farnbacher Ferrari of Farnbacher/Simonsen is harried by the race-winning Peugeot at Bruxelles. One of the advantages of endurance racing is that it allows you to circumnavigate the track at ease while the race is going on. We already did that to great effect during the Spa Six Hours events, and this time it was no less enjoyable. Again, having left the pit and grandstand area behind us, we soon forgot about the race, as our attention switched to the cars and their sounds, and how those sounds differ in various places along the circuit. At the top of the Raidillon, for instance, the noises are eerily bouncing around between the trees. Then, further up the Kemmel straight, the top revs will swallow you up with maximum Doppler effect. At Bruxelles, the cars become miniature-size toys as they head down from Rivage to Pouhon, and with a bit of luck you will hear the tyres squeal as they are submitted to the lateral forces in that quick follow-through. At the exit of Blanchimont, approaching the Bus-Stop chicane, the noise is rolling up the slopes, allowing the popping exhaust notes of the overrun to come across very differently from the similar breaking area on the high plain at Les Combes. Guillaume Moreau's Oak Pescarolo-Judd 01 takes Pouhon flies around the daunting Pouhon corner. There's a lot of acoustic variation between the cars themselves, too. The Audis go sweesh and swoosh as they have always done, but the Peugeots are louder this year, now almost approaching the sound of a muffled American V8. The Judd engines powering several petrol prototypes are overwhelmingly raunchy, with the V10 in the Rebellion Lola LMP1s grawling at a darker pitch compared to the screaming V8 in the Oak Pescarolo LMP2s. The Aston Martin V12 in the Signature Lola is easily distinguished, as it yanks out revs almost like a Formula 1 engine. It's totally different from the grumbling stock-block V8s in the Luc Alphand Corvette and the two Saleens. Especially the Carlo van Dam-pedalled Full Speed Saleen singles itself out by its noise, not as much from its engine as from its upshift, which is almost like a cannon going off. You'll know when Carlo van 'BAM!' accelerates away. And so, out on the track, bereft of any information about the race's progress, about who is in the lead and who is dropping back, you will get drawn into the inherent rhythm of the race. You leave your mental lap chart behind to become the true spectator. It is trance-like. In these kinds of events, taking their time to settle down, it is very inviting to take a seat on an errant rock dug into the spectator slopes at Pouhon and just sit there for an hour or so, simply admiring the little cars down below as they attempt to take that mighty sweeping corner without the driver lifting the throttle. You are almost continually surrounded by noise and still it's so very zen. There was more out there to see but the race. It was interesting to compare the activity in a modern paddock to the Transit-and-trailer approach of days gone by. Moreover, the LMS paddock is strikingly contrasting in itself. It has that blend of huge-budget glitter seen at Peugeot and Audi, with their near-F1 facilities, and the gentleman racer spending a fortune just to belong. Even between the top teams there are differences. 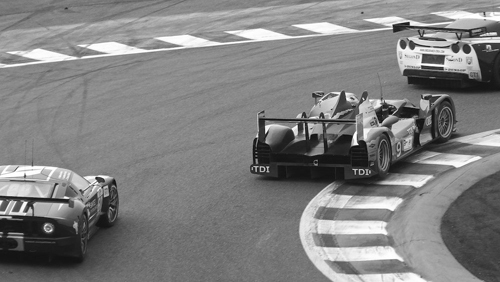 The Audis continue to be fielded, as is tradition, by Joest, a close-knit team of racers. They know their drill, and each performs his task with the proverbial Teutonic discipline. Yet they also appreciate the importance of the public. People are invited to look around while the team are at work, and even Shell's top-secret super diesel fuel isn't guarded with loaded rifles. In contrast, there is no Gallic frivolity over at Peugeot, right at the other end of the paddock. Instead, broad-shouldered security gorillas keep everyone bar the PSA board away from entering the hallowed domain of the three 908 HDi FAPs. Further down the paddock we found similar variations in hospitality. A mechanic from a German team of enthusiasts barely able to make ends meet profusely apologies when he accidently closes the garage door in front of someone's camera, while at a GT2 factory team a well-known driver turns his back to the amateur photographers. The mechanics are less fussy about those attentions. They know that they step into their part of the limelight when they collect a damaged car from the dépannage or have to take their car to scrutineering. Even the Peugeot engineers are cool when they take time out for a ciggy and a laugh. 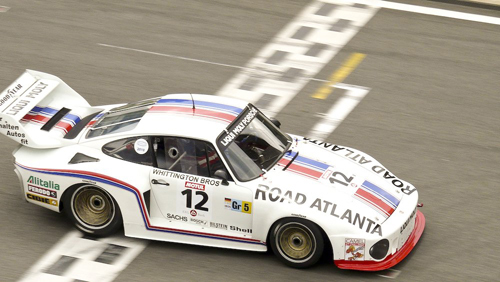 Ex-Whittington Brothers Porsche 935 starts another lap in the CER race. So what else was going on except the French Porsche Cup and the Radical Masters playing out their supporting acts? On Saturday, we had the pleasure of watching the Classic Endurance Racing cars qualify and race. Still some of the old stuff then! The CER is the LMS's historic branch, and a CER entry is a certified guarantee of a slot at the Le Mans Classic in early July. No 24-hour racing for the CER cars, however, since one hour is proving long enough for many competitors. It was fun seeing these cars raced by enthusiasts with a hell-or-high-water attitude, as their tyres went off ten minutes before the end of the race. One after the other slid off at the Bus-Stop, leaving the few drivers with a steady endurance approach to pick them off in the dying moments. To finish first you first have to finish is a motto that applies even more to endurance racing than to sprint events, and it certainly applied to comfortably the fastest car of the field, the beautiful Porsche 936 of Swiss Jean-Marc Luco, which was broadsided at La Source by a 911 driver who was either tired or hateful. Luco was on a comeback race already, having swapped ends involuntarily at the start, and was up into second place when he was punted out. It left Paul Knapfield to romp away to an unchallenged win in his ex-Andretti Ferrari 712.